Takeaway: Follow these tips to reduce the number of slip and fall accidents in your workplace. Slips, trips, and falls make up the majority of general industry workplace accidents. Second only to motor vehicle incidents, they cause 15 percent of all accidental deaths – about 12,000 per year – and are among the most commonly reported injuries, representing about 25 percent of all annual claims. With appropriate precautions, however, most of them are completely preventable. 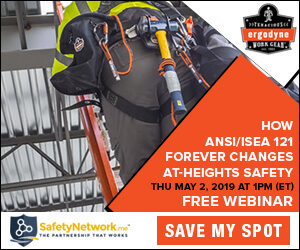 OSHA updated its General Industry Walking-Working Surfaces and Fall Protection Standards in January and estimates that the updates will prevent 29 fatalities and 5,842 lost-workday injuries every year (see Lost Time: How Does It Add Up to learn more about LTIs). This is a significant improvement, but slips and falls will continue to be a risk to workers across every industry. This article will go over the basics of slip and fall hazards and give you some tips for keeping workers safe and on their feet. Slips are a large contributor to falls in the workplace and can result in result in back injuries, strains and sprains, contusions, fractures, and even death. Between lost workdays, decreased productivity, and increased healthcare and compensation costs, costs to both the employer and the worker can be substantial. Perhaps even more concerning is when slips and falls involve tools and equipment. Workers who carry sharp or heavy tools or work around dangerous equipment are at increased risk for serious injury during a slip and fall incident. Falling is bad enough. Falling against a circular saw or while holding a power drill could be a whole lot worse. Some materials are more likely to cause slips than others. Highly polished floors, including concrete, marble, and ceramic tile, can be slick even when dry. Freshly waxed floors may look nice, but the wax coating can reduce friction enough to make it hazardous surface. Workers should also be extra cautious when transitioning from one flooring surface to another. Quickly moving from carpeting to vinyl or grid to smooth concrete might be enough to give an unsuspecting worker a nasty surprise. While the threat of slips can never be fully eliminated, there are a number of ways you can mitigate risks in the workplace. Here are six steps you can follow to get started. Footwear with proper traction is essential for the workplace. However, there is no single type of footwear that will be anti-slip in every condition, so it's important to assess the working conditions and consult with the shoe manufacturer, if necessary. Make sure the footwear fits well, as properly fitting footwear increases comfort and prevents fatigue, which, in turn, helps employees remain alert, focused, and safe. Good worksite housekeeping can significantly decrease the risk posed by potentially slippery surfaces. Ensure workspaces are free of clutter and that slip and trip risks like extension cords and tools are kept out of the way. Even when the work involves a lot of liquids, oils, dusts, and particles, there are ways to minimize the amount of it that winds up on the walking surfaces. Exhaust and ventilation systems can help keep particles and sawdust under control, and raised edges on worktables can prevent debris from reaching the floor (for more on how to manage dust in the workplace, see Construction Dust: The Risk to Health and How to Create a Safer Working Environment). Drip trays can be installed to contain any leaked or spilled oils, lubricants, and even water and condensation. Workers can't recognize and avoid a hazard if it isn't visible. Workspaces, walkways, and stairs should have adequate lighting to ensure workers are able to clearly identify any slip hazards that may be present. Aisles and paths of travel, in particular, should be kept well lit. Conduct a hazard assessment and install slip-resistant flooring in high-risk areas. Sloped floors and transition areas should be clearly marked with anti-skid paint or slip-resistant strips (preferably in yellow, to stand out). Training should be ongoing and there must be continuous follow-up to ensure the rules are being followed and identify areas for improvement. Keeping employees engaged is key to effective training and fostering a safe work environment. In summary, slips, trips, and falls are an inevitable risk in any workplace. But you can take steps to reduce risks and protect employees. With traction and training, you can create a safer workplace for everyone.